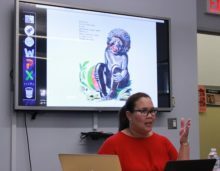 On October 21, 2016, the NYU Jordan Center for the Advanced Study of Russia hosted a talk titled “In to Africa: The Soviet Union and Its Civilizing Mission as Depicted in 1920s Soviet Children’s Literature” by Raquel Greene, Associate Professor of Russian at Grinnell College, who presented a part of her manuscript on the construction of race, primarily Africa and Africanness, in Russian children’s literature. Explaining the choice of the 1920s as her focus, Greene said that the decade represented the sort of freedom and creativity that ceased to exist in the 1930s. Throughout the 1920s, the focus of critique for Soviet writers was mainly Africa and colonialism, unlike later decades, when focus dramatically shifted to the United States and the state of African-American children. For instance, one criticism from a series of historical stories for school-aged children read: “They didn’t consider at all they were buying real people, tearing children away from mothers, husbands away from wives. They forgot that black people could feel, love and suffer.” While Russian writers acknowledged black humanity, this was still accompanied by negative assessments: “Completely black skin, curly black hair, large thick lips […] they live in separate tribes, obey their princes, they are pagan, frequently kill people in the name of their multiple gods.” As explained by Greene, authors distinguished among Africans according to European standards of beauty and adherence to Western monotheistic tradition, as well as by stereotypes of African physicality, inherent laziness, and natural artistic inclinations. 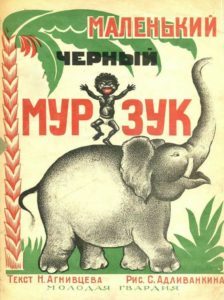 In the 1920s, some of the Russian children’s writers who depicted Africa and blackness confronted colonial exploitation, while others pointed at the absence of civilized development and the need for humanitarian intervention, Greene explained. But the common thread of the narratives, according to Greene, is that they underscore the weakness of western ideologies and strengthen of the Soviet Union’s moral position; “in these tales, benevolent, color-blind Soviets become alternative civilizing agents.” As Greene demonstrated with the following case studies, however, what resulted were children’s texts that reinforced negative racial stereotypes and with already deep-seated negative notions of Africanness. 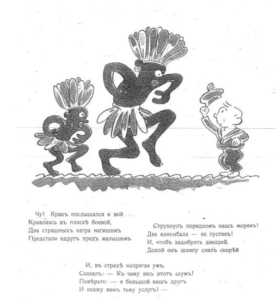 V Gyostiakh u Negrov (1920) is another narrative of a child, young Petrushka, visiting other races. His boat capsizes and he is met by native cannibals. In terms of behavior and language, the natives are essentially children, and in fact the monkey who steals Petya’s clothing is smarter than the natives. In the end, they all return to Russia with Petya, who now has his own civilizing mission, but the happy ending is problematized visually; the natives are highly stylized in contrast to the white child. 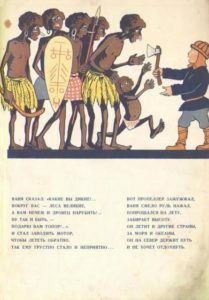 The most problematic narrative, according to Greene, is of Detki Raznotsvetki (1927), in which Africa’s otherness is depicted most significantly. Here Greene pointed to the comparison between the visual depiction of the African child with the children of “other races” that Russian boy Vanya wanted to meet. Greene interacted with the audience to interpret the illustrations accompanying these stories, noting the various forms of undress, the environment, wildlife, facial features and human extremities of children and the caricature for “ethnic dress,” pointing out how the African child is the only one who is always completely naked. 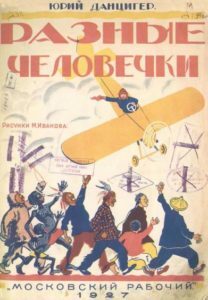 Detki Raznotsvetki was criticized in the Soviet Union after its publication because its lack of a civilizing mission; there is no noble purpose, just “pure orientalism.” A number of literary circles denounced the book, as Greene explained, calling it “chukovshchino,” meaning pointless entertainment. Specifically, it came under the fire of Nadezhda Krupskaya and parents of children attending the Kremlin kindergarten. As a result, its author fell into oblivion, while the illustrator moved to France, where he was met with much less hostility. The Fantastic Adventures of Makar the Fierce, by Nikolai Oleynikov, was the first Soviet children’s comic series to be published. Oleynikov was known for creating modes of expression that children could relate to. Greene said that the simplicity of the graphics and the portrayal of the natives evoked the Tintin series to her. In this work too, there is a stark contrast between how the Slavic child and the natives are depicted. Many of the questions directed at Greene during the Q&A sessions had to do with other iterations of the tropes she had discussed. 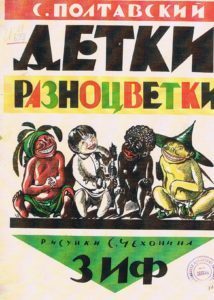 Greene said she has never come across stories of children discovering different races within the Soviet Union; rather, the characters were always Slavic.